After a light supper on June 19th, 2006 I ventured just a few miles from home to the corner of 40th Street and Camelback Road. The day was still very hot and traffic was heavy with workers still rushing about to get home after work. Shortly I was strolling along the banks of the Arizona Canal. Lots of birds were about. Dozens and dozens of Cliff Swallows were darting around and under the bridge abutments hesitating a moment as they approached their mud nests constructed there. Day finishing up. Like us, these swallows use primarily eyesight to gather food, interact with other birds, and to find their way. Almost that time to turn in for a night's sleep as daylight begins to fade. There above, high in the sky, are White-throated Swifts, even greater masters of acrobatic flight. Their long pointed wings and cigar-shaped body allow them to propel through the air at astonishing speeds and take stunning dives and swerves - soon they too will retreat to their night-time roosts in the shear cliffs of nearby Camelback Mountain. It's going to be a long hot night and so a lot of birds are at the canal bank gulping as much water as they can. Glossy black Great-tailed Grackles, iridescent European Starlings, and plethora of doves (Inca Doves, Mourning Doves, White-winged Doves and Rock Pigeons). Once settled in to their overnight nests they don't dare venture out for more water - they are visual creatures at a severe disadvantage when the daylight is gone. Without any command from my conscious thoughts my own senses are adjusting to the changing conditions. My sense of smell and hearing are sharpening. Oh, a Northern Mockingbird calls out sharply, followed a few minutes later by the even sharper call of a Curve-billed Thrasher. This isn't singing ... these are goodnight signals. Reminders to neighbors that the signaler has finished another day in good shape and will be back awake again, bright and early tomorrow morning, to reclaim the territory. Males and females chitting their good nights. Not fifteen minutes from my car I arrive at a flood control channel and tunnel adjacent to the canal. It was built to divert flood waters from Camelback Mountain away from entering the canal. Soon this cavelike structure was discovered by Mexican Freetail Bats. Thousands now live and breed in its dark confines from May to October. It's definitely getting dark as a new bird makes its appearance: Lesser Nighthawks. These are larger birds with long graceful wings sporting a distinctive white band out near the tip of each wing. These are crepuscular hunters - meaning they come out to hunt at dusk and dawn when there is still light but not enough for most other visual hunters to work. Nighthawks have huge eyes and mouths that can open wide like a gate. They dart this way and that as they spot a flying insect and scoop them into their open mouths. When they sometimes swoop close to the ground they frequently utter a faint and sweetly strange sound. It's been fifteen minutes since the sun dipped below the horizon and now the first of the bats are beginning to stir. I haven't spotted any yet but their faint excited squeaks and a musky odor are wafting out of the tunnel. Was the smell there earlier or might my sharpened olfaction just now be kicking in? The first couple of bats careen out of the cave into the twilight but u-turn and go right back inside. Too bright yet. Plus the nighthawks are harassing (not really a danger as these birds are not equipped to prey on bats). In the distance I hear playful screams of kids in their yards and dogs barking. I think we all feel a heightened sense of awareness - even fear - as dark approaches. We know instinctively that we are at a disadvantage in the dark. A bit of adrenalin shoots into our blood stream to keep us alert. Finally great numbers of bats are zipping out of the cave-tunnel. First dozens. Then many dozens - even a hundred at a time. This is a maternity cave and there will be many newborns that stay behind while there moms are out feeding on insects overnight. Come morning they will be eagerly awaiting a breakfast of bat-milk. Some bats are foraging in the trees nearby. Even more are swooping over the canal where aquatic insects emerge for a brief night's activity. These bats may travel many miles in search of insect food. Among their favorite prey are mosquitoes. Plus they consume many millions of other insects that if too abundant would cause us grief. So these mammals offer us a service in addition to a real mid-city wildlife viewing. Walking back to my car I am trying to imagine the great rhythms of nature that repeat day after day even as I work, sleep and play in my city. On the gravel path ahead a nighthawk has alighted and its broad eyes reflect back an eerie red from my headlight. Overhead, the ever-bright Jupiter reminds me there is a lot of universe out there and that I am but a bit player. I need a cool shower and a night's sleep. These nocturnal creatures with their echo-location and huge eyes will rule overnight. Google Images of Mex Freetails. (Tadarida brasiliensis). 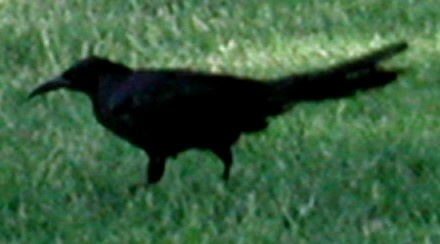 Male Great-tailed Grackles are glossy black and often drink from canal. 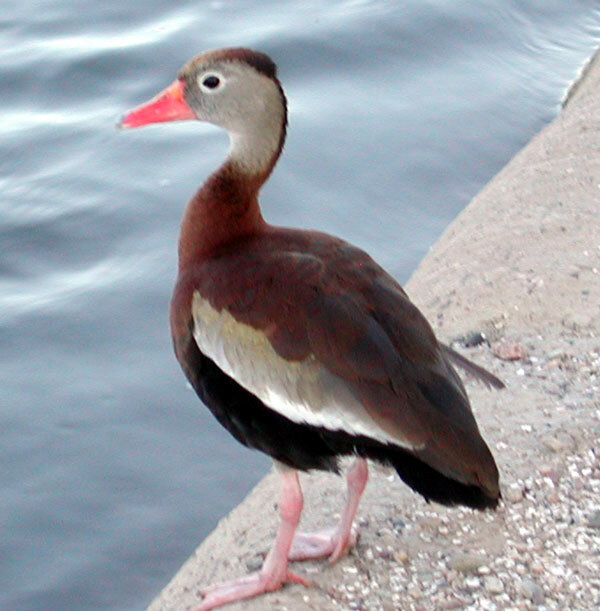 This Black-bellied Whistling Duck was a regular resident along the canal for the summer of 2006 and 2007. There is easy parking at Wild Oats grocery where there is also a Baskin Robbins icecream shop and a coffee shop. Flood control tunnel is located about 1/2 kilometer west of the 40th Street bridge at Camelback Road in Phoenix, Arizona. The path along the north side is unpaved, whereas the south side is paved and is popular with bicyclists and joggers. Entering the tunnel is prohibited to protect the bats. The flood control tunnel runs along the north side of the canal all the way to 32nd Street and above it vegetation has been restored to more-or-less natural Sonoran Desert. There are interpretive signs identifying many plants -- although several signs sit in front of plants that have long since disappeared. These were seen: Blue Palo Verde, Creosote Bush, Ironwood, Velvet Mesquite, Mexican Palo Verde, Desert Broom, Triangle-Leaf Bursage, Desert Willow, Brittle Bush, Catclaw Acacia, Sweet Bush, Desert Senna, Hop Bush, Jojoba. Some non-native invasives also present: African Sumac, Salt Cedar, California Fan Palm. Desert birds are abundant along with a thick population of the escaped and proliferating Peach-faced Lovebirds - a small parrot native to the Namibian Desert of southwestern Africa. On June 1st, 2006 I counted these birds in the area: Cliff Swallow, House Finch, Lesser Nighthawk, Abert's Towhee, Great-tailed Grackle, White-winged Dove, Mourning Dove, Anna's Hummingbird, Killdeer, Curve-billed Thrasher, Northern Mockingbird, Cactus Wren, Brown-headed Cowbird, Peach-faced Lovebird, White-throated Swift,Green-backed Heron, Say's Phoebe, Mallard, Harris' Hawk. Quite a few desert trees along the canal bank have a witch's broom-like growth I am thinking might be due to herbicides - source? With toxic chemicals causing this kind of havoc with our native plants, imagine what they're doing inside us. 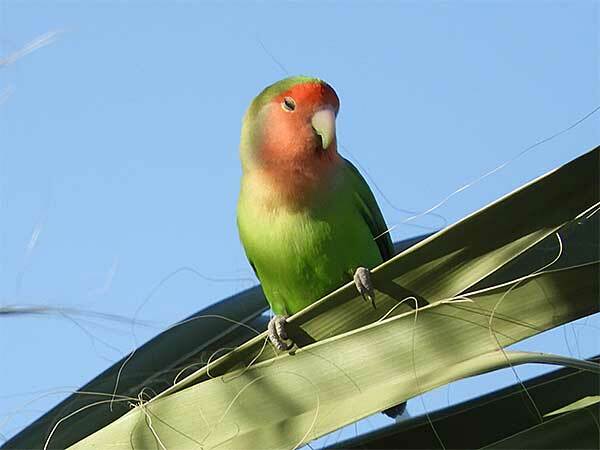 Peach-faced Lovebirds have escaped from the pet trade and are breeding in Maricopa County.